One, the development promise and need for naval support for the massive China-Pakistan Economic Corridor (CPEC) project, which means new railways and roads to give the Chinese trade access to a new super port at Gwadar, near the Iranian boder. And two, the shadow of unresolved tensions between Pakistan and India over the disputed and divided Kashmir region and the growing nuclearisation of both nation’s navies with implications for the wider Indian Ocean region. AMAN-17, the fifth in a series held since 2007, has seen naval assets sent from China, Russia, Indonesia, Turkey, UK and the US, among others. The Australian frigate HMAS Arunta, which is on a nine-month tour of duty in the region, was present, but Indian vessels were not. Pakistan Fleet Commander Vice Admiral Syed Arifullah Hussaini. ‘I’ll ask you, does India want AMAN?,’ Pakistan Fleet Commander Vice Admiral Syed Arifullah Hussaini tells me, referring to both meanings of the word. While the local newspapers are full of bellicose posturing between both sides, the atmosphere at AMAN-17 has been highly cordial, with ceremonial and celebratory events ahead of the seaborn exercises and fleet review. The Chinese naval presence is especially significant given the emphasis on CPEC, which involves more than US$50 billion worth of projects. The projected amount of shipping from Gwadar in the already volatile waters of the region will require plenty of naval support. 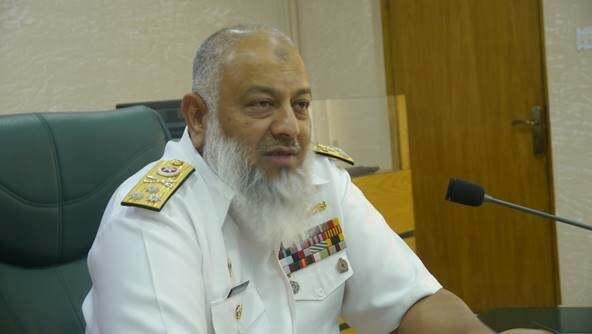 On a goodwill visit to HMAS Arunta, the Chief of Naval Staff Admiral Muhammad Zakaullah underlined the need for coalition building and security cooperation. Listening closely in agreement was Arunta’s Commander Cameron Steil, who is leading the ship on the Australian Navy’s 64th deployment to the area since 1990. Not yet halfway into a long nine-month tour called Operation Manitou, the crew of 177 is involved in counter-terrorism, counter-piracy and drugs interdiction operations. Steil said the detailed coordination of each navies’ different rules and regulations was invaluable for possible future joint operations. ‘The expenditure of a round out a barrel is almost inconsequential from what you get out of an exercise like this, which is all about the planning and understanding,’ he said. The Pakistan Navy showed off their special forces anti-terrorist capabilities with a dramatic demonstration of a shore-based hostage rescue, involving parachutes, hovercraft, drones and much gunfire. Security has been high in Karachi in the wake of a suicide bombing in Lahore earlier this week, which killed 14. Most naval personal stayed on their heavily-guarded wharves and those staying ashore (including the media) mainly lived in one strongly defended hotel and were escorted outside at all times in large and fast-moving armed convoys. The threat Somali pirates pose to the Indian Ocean might have diminished, but according to Hussaini, it may be dormant but it is by no means dead. ‘Piracy is not as big a menace now as it used to be but if we stop guarding these waterways then it can re-appear,' he said.